In the growing European electronics market, manufacturer C.E.P.I. Rack s.r.l. in Italy has pioneered a new guide rail for module racks which hold and transport electronic circuit boards. 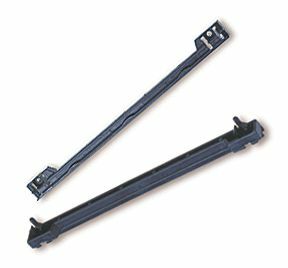 The guide rails are made from an RTP 300 Series polycarbonate specialty compound that provides electrostatic dissipation protection and is UL 94 V-0 flame retardant. Individual circuit boards placed into a set of guide rails can expose sensitive components to damage from static. C.E.P.I.’s innovative solution embeds ESD properties into the rail material, making them more cost effective than competitive solutions. The conductive rails avoid assembly time associated with installing copper or iron contacts on non-conductive flame retardant polycarbonate rails. Engineers at RTP Company’s Beaune, France, plant formulated the compound with a volume resistivity of 104 ohm-cm and surface resistivity of 109 ohms/sq. C.E.P.I. Rack s.r.l. is located in Druento (Torino), Italy. RTP Company’s distributor in Italy is Daire Chemicals S.p.A. in Pianezza.